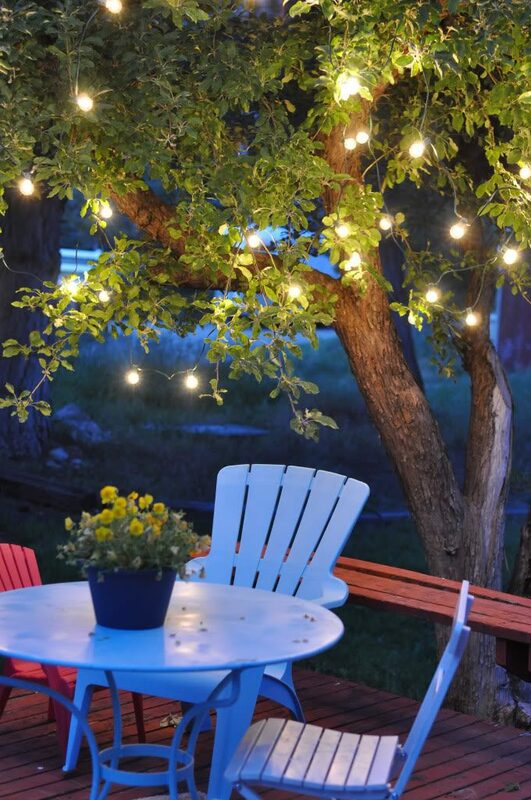 When the weather turns nice, we love to spend time outdoors and globe string lights are the perfect addition. Whether we’re talking about Houston in April, Chicago in June, or Denver in September, temperate weather just begs us to go outdoors…especially in the evening. 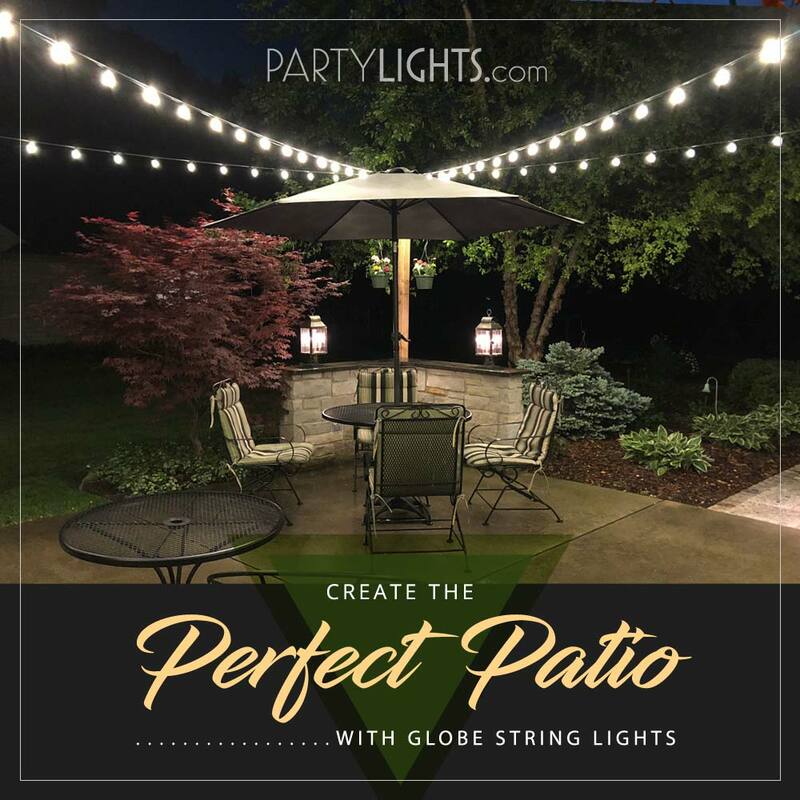 You may be decompressing after a long day at work, hosting a cookout on a Friday night, or just relaxing at the end of the weekend, but regardless of the motivation, kicking back outdoors is much more appealing with outdoor globe string lights. Now, it’s easier than ever to bring the ambiance of your favorite outdoor restaurant or bar to your own home patio. Regardless of the type of space you have, we have ideas that can get exactly the vibe you’re seeking. Large spaces are like a giant blank canvas — you can do whatever you want, but with some planning, it’s easy to make the most of it. For a large open space with a focal area like a table and chairs for gathering, use globe string lights to both define the space and provide focus. String lighting along the perimeter, whether from the eaves of a structure or hanging along a railing or banister to define and emphasize the outer edges of the space. 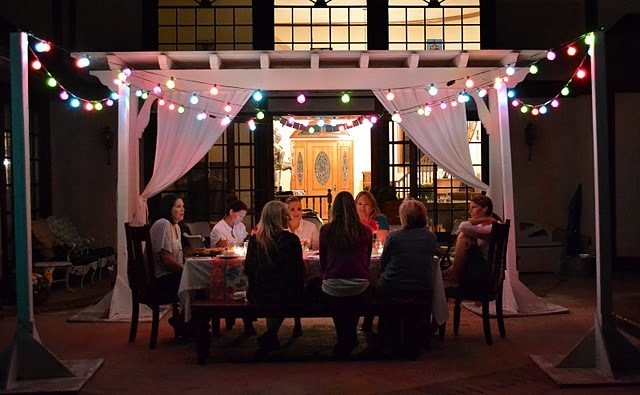 Then, use additional strings – or perhaps more decorative café string lights – to bring focus to the main seating or gathering space using criss-cross strings intersecting over the table or stringing lights directly under an umbrella or other structure over the table. For a small quiet personal space, use lights to make the space feel a bit more expansive, yet still cozy. Instead of placing lights along a railing, place them high above your space, allowing the lighting to extend further outside which will maintain the intimacy of the space without making it feel too claustrophobic. Shorter lengths and smaller bulbs of globe string lights may come in handy for this cozy, small spaces. Is your patio a pergola? Structure is perfect for adding globe string lights. 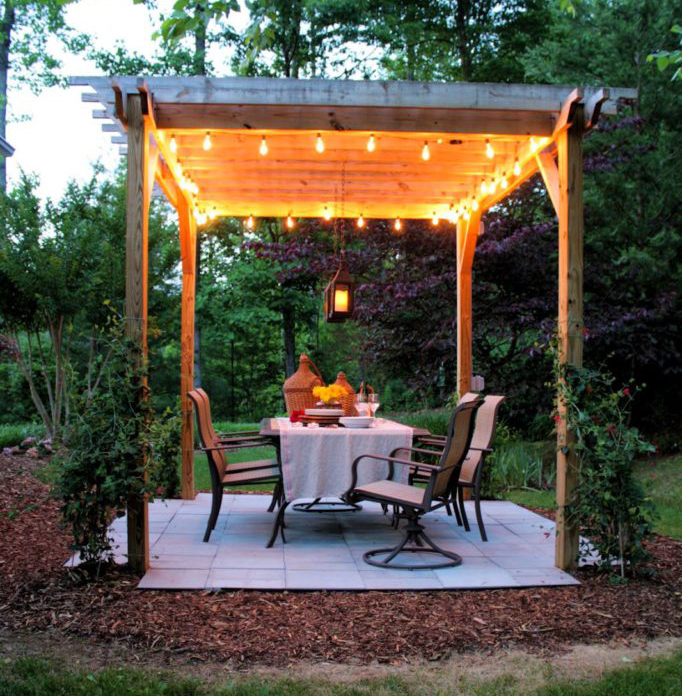 A freestanding structure such as a pergola or gazebo will dazzle with lights around the inside perimeter. A perfectly lit pergola across an open space looks like an oasis and adds a distinct resort feel to your yard. For larger structures, add additional string in a criss-cross pattern to bring more lighting to your interior, particularly for a dining or gathering spot inside the pergola. You don’t need to have a large space to use globe string lights. 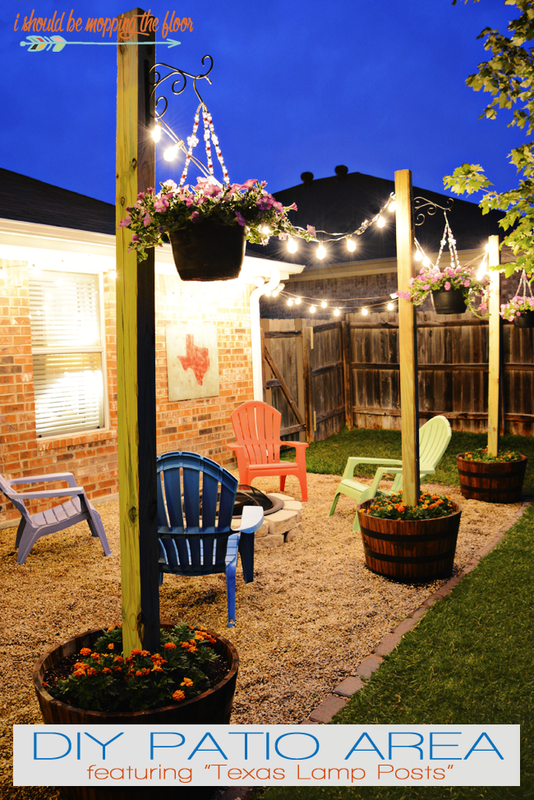 A smaller patio or breezeway becomes very inviting with string lights strung across the open space along with a few comfy chairs. 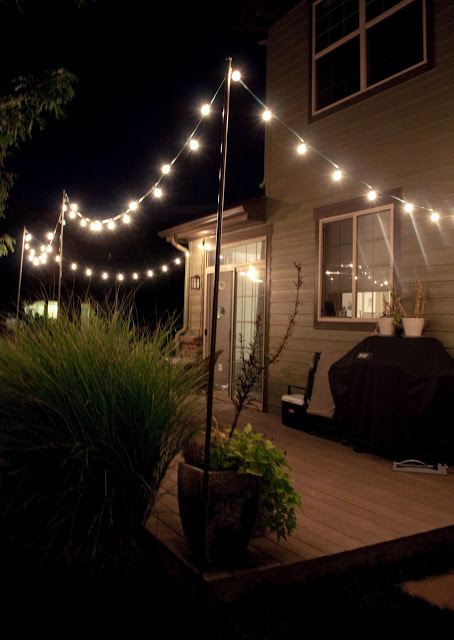 Use a zig-zag pattern to distribute the light evenly…and use our guide to hanging outdoor lighting to learn how easy it is to securely string lights! Of course, sometimes the only structure you need is provided by nature. 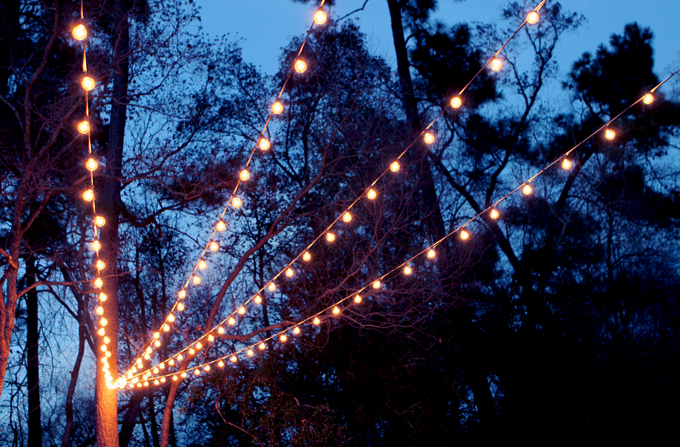 Trees growing over or adjacent to a patio provide the structure; string lights can be wound around branches for an elegant random design that only nature can provide. Alternatively, lights can be strung from branch to branch for a more whimsical look. Either way, the natural beauty of the tree works with your globe string lights to provide both illumination and an inviting appearance. 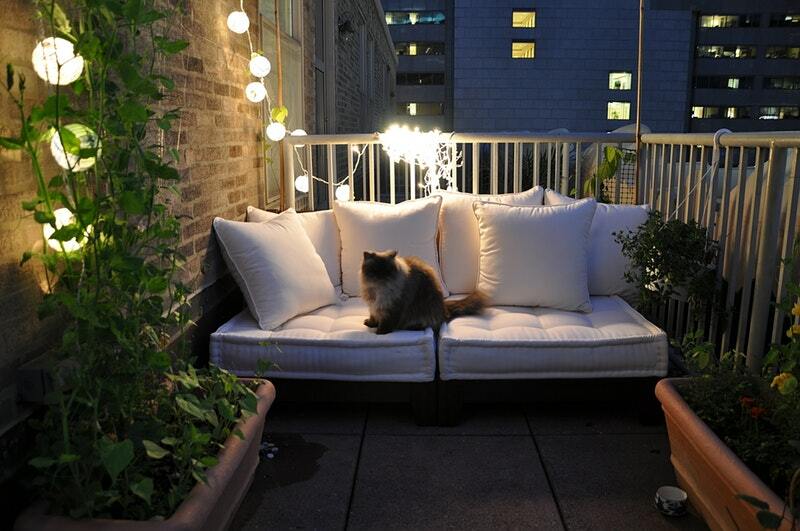 Even the smallest of outdoor spaces can be enhanced with string lighting. 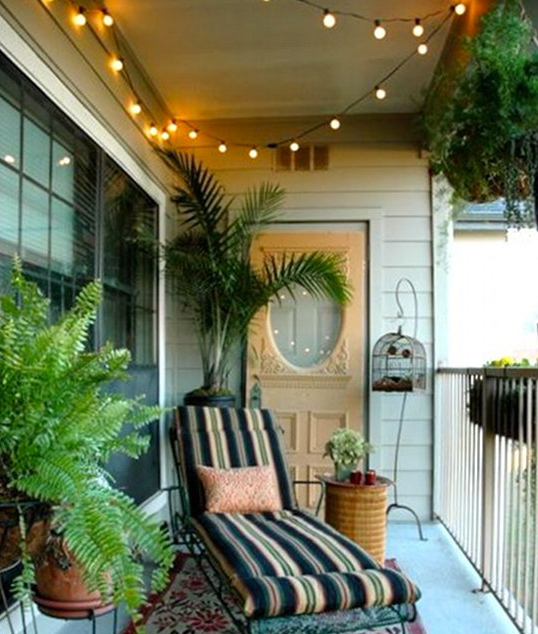 A small apartment patio can be transformed into a compact getaway and enhanced with lighting along the railing, or simply by stringing loops of string lights along the wall. For a more focused lighting in certain areas such as for a reading light, simply wrap the cord together and cluster several bulbs together! When people think of outdoor patio lighting, most think about low power, warmly lit white bulbs providing uniform lighting and color to the space. However, for a more unique look or for a special event, use colored bulbs in your globe string lights to add a bit of panache to your patio space. 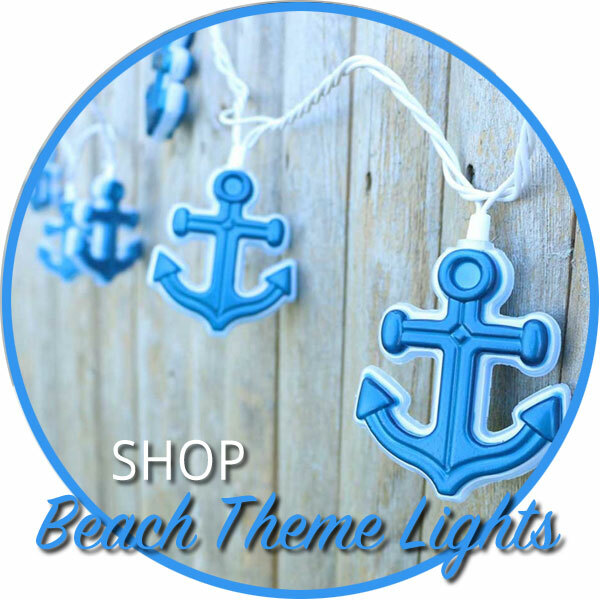 A single color can complement your outdoor decor, or use a couple different colors to match a theme. Or, go for an eclectic look with multiple colors scattered throughout your space! We’ve touched on using buildings, railings, and other structures – even trees – to hang your lights, but some settings may require some additional perimeter posts to frame up your space. Creating your own posts can be amazingly simple. Metal posts give a simple and clean look, and are easy to install. For a more natural look, large wooden posts make a great lighting support…and they can be used to hang plants or other decorative items as well. Check out this great outline of this simple project. 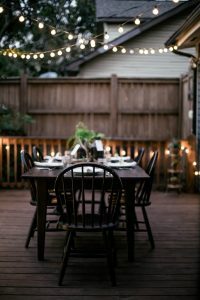 We’ve suggested some ways to use various structures to help support your lights, but remember that the lights themselves can be a part of the decor for your outdoor patio space. And that may mean injecting a little creativity into the string themselves. For some spaces, a perimeter lighting pattern may work best, but for others, consider an X or cross pattern. Zig-zag patterns are popular, but you can also use a fan pattern especially if you want to create a focal point from which the lights flow. Get creative! 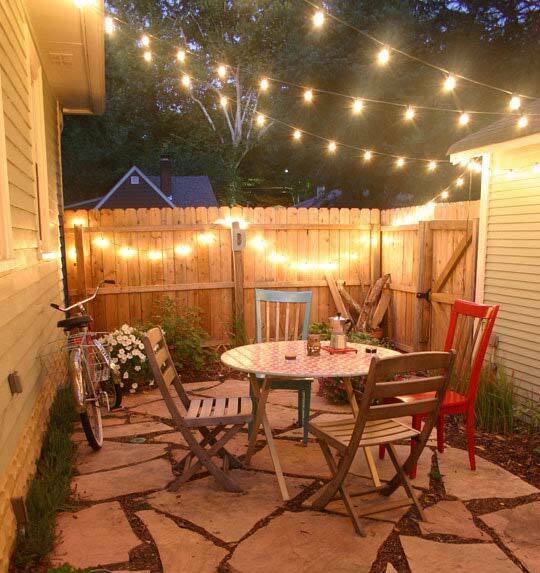 As always, we’d love to see how you’re using lights to brighten up your outdoor patio space. Show us your handiwork; email us or post a picture and tag us on Facebook (@partylightscom) or Instagram (@partylights_com).